The history of Italian is a long and chequered one. Although Italian is not as old as the language of its near neighbour Greece, Italian is a direct descendant of Latin, the language that bound much of Europe together in ancient times and which still rears itself in the style of the Romance languages across the continent today. Italian is often described as the language of love – perhaps because of the way it sounds when it rolls off the tongue or perhaps because of the romantic connotations of Italian men. But the languages in it's own form is relatively recent – Latin was, of course, the language of choice across the Roman empire, which persisted until, in relative terms, recent history. The first time the language of Italian was recorded was in the work of the country’s most famous poet, Dante, in the 14th century. Prior to this, people living in Italy spoke Latin, which had gradually transformed itself into a number of Italian dialects. There are texts that pre-date Dante by several hundred years, but as the dialects were arranged in a haphazard manner, he is generally credited with creating and recording the first standard form of Italian for the whole country to share. Because of the way the language of Italian came into being, the dialects still persist perhaps more here than in other countries. Because the north of the country is bordered by France and other continental European countries while the south is relatively isolated, surrounded as it is by water, the northern dialects owe more to the neighbours of Italy, while the southern dialects are older and remain in a more organic form. The unification of Italy, where all of the city states were fused into one country, took place in the 1800s. And it was not until this time period that Italian was adopted as the standard official language for the country. 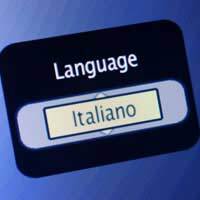 Italian is still the closest relative to Latin of the Romance languages in use today. This means, although the language itself is not that old, it's links date back many, many thousands of years. This is hardly surprising, given the dominance of the Roman Empire, which took Latin as its language. The eastern part of the Empire did come to use Greek in time, but for the ordinary people of the Empire, Latin remained the favoured language. So, as we can see, Italian bears a strong resemblance to the language, although the language of one of its islands, Sicily, was even closer. Sicilian is still spoken in much of the island although most islanders are bi-lingual. The links with Latin, ensure that the history of Italian, and indeed Sicilian, date back much further than their original inception. Sicilian links to Latin can be seen and heard in every word and turn of phrase. It is a completely separate language from Italian. Although it is Sicilian and not Italian, which is closest to Latin, there are plenty of words and sounds, which mark out Italian as a true descendant of Latin.